How is it that Takoma Park's S&A Beads paid $2,064.14 in city taxes in 2016 but nearby restaurant Kin Da, occupying a similar space, paid only $614.73? And that SunTrust Bank, just steps away, paid just $364.41? What sort of system charges a small, locally owned business 450% more than a megabank that occupies a larger commercial space? Takoma Park's business-tax system is not fair, and it has been that way for decades. The inequity results from city levy of personal-property taxes on commercial inventories, obviously not paid by service businesses including my own Takoma Park consulting firm. It is worsened by a special exemption granted by Maryland state law to financial institutions. The good news is that we — that is, the Takoma Park City Council — can set the city's tax system right without sacrificing the revenue that funds city programs benefiting local businesses. Either of two proposals would address business tax inequity. Each would offer relief to small retail businesses. One, a local-ownership exemption on inventory taxes, would cost the city only a modest revenue loss. The second, replacing the inventory tax (or perhaps all personal-property taxes, also paid by businesses on equipment and furnishings) with higher real-estate taxes, and would redistribute the tax burden and entail no revenue loss at all. The backstory is complicated but captured in a pair of articles published earlier this year. 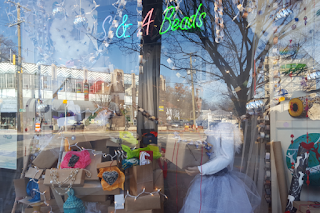 Start with my May Takoma Voice column A tax break for Takoma Park businesses?, and then consult S&A Beads' owner Larry Silverman's Inventory tax an unfair burden. Takoma Park's goal should be to raise revenue sufficient to fund needed city services, via progressive taxation. By "progressive," I mean balancing fairness — Larry is right that the inventory tax means that retail businesses pay far more than service businesses for the same city services — with policy goals that include promotion of locally business ownership, which recycles profits back into the community. This sort of policy goal led to the creation of homestead credits for real-property taxes. If you own the Maryland home you live in, the growth in real-property taxes you pay due to higher reassessment is capped at ten percent per year. That is, Maryland grants favorable tax treatment for owner-occupied residences. As an aside, I disfavor a top-line inventory exclusion granted to all businesses. The inventory tax is not a significant burden for the city's largest inventory-tax payers — Advance Auto Part, Walgreen's, Aldi, and the like — and none has sought, nor deserves, tax relief. Elimination of the inventory tax, or perhaps of all city personal-property taxes on businesses, offset by higher real-estate taxes on commercial properties, is an alternative that would be a step toward business-tax equity. Property owners would pass their higher costs on to their business tenants, and Takoma Park would join those Maryland jurisdictions that offer a full or partial inventory-tax exemption. How would this work? The city would create a new real-estate tax class, based on geographic location and use. For comparison purposes: Rockville has four tax classes. Commercial properties within the Town Square boundaries, Class 1, are currently taxes at $0.622 per $100 assessed value, while commercial and residential properties outside Town Square, Class 50, are taxed at less than half that rate, at a $0.292 rate. The City of Takoma Park could similarly create a class for commercial properties in commercial areas city-wide. It would include Carroll and Laurel Avenues, the storefronts at Maple and Sherman Avenues and Flower Avenue at Erie Avenue and near Piney Branch Road, and the New Hampshire Avenue and University Boulevard corridors. The council would task staff to calculate a rate that would offset elimination of the inventory tax, or of all personal-property taxes paid by businesses. I would suggest a phase-in over several years because to avoid punishing landlords whose tenants have multi-year leases. The system would be progressive although not completely fair: property owners in more-desirable parts of town already pay more for city services based on valuations higher than those in less-desirable areas. I would keep it simple, however, and not apply different rates to different parts of the city. I have described two approaches that address Takoma Park business tax inequity. That this bit of unfairness should be addressed, I hope all will agree. The state and county, which handle property tax assessments and payments, will need to be help. The system has been unfair for years. We can and should act now to set it right. instagram web viewer Please give some advice on how to achieve this kind of posts. instagram online web viewer Very awesome!!! When I seek for this I found this website at the top of all blogs in search engine. This is highly informatics, crisp and clear.Marketing automation I think that everything has been described in systematic manner so that reader could get maximum information and learn many things.